My wife, Polly, and I were about to spend $45,000 on a fancy remodeling job for our Chevy Chase kitchen back in 1996 when we got a second opinion in the nick of time. Forget the new cabinets, the granite countertops, genuine hardwood floors, shiny appliances and recessed lighting, said Julie Lucas, a project manager whom we met through friends. Too expensive, Lucas said. Chez Heath's kitchen instead has industrial-strength linoleum flooring, new hardware on old cabinets, basic appliances and countertops that are a knockoff of a name brand. We saved $30,000 (and spent most of it on an ungodly expensive trip to Britain) thanks to the manager's "value engineering." I have told that story with a preening grin on my face a million times. Ask my long-suffering friends. So I loved it when Thomas Glass, president and founder of Glass Construction in Cleveland Park, riffed on the importance of value engineering. Glass has built a profitable niche rehabilitating historic homes for the Washington area's rich and famous. His company specializes in everything from the 18th-century Federalist-style Georgetown townhouse requiring a facelift to the "cottage" off Connecticut Avenue in Cleveland Park that needs a new porch. "I love those old houses," he says. This is high-end stuff. In Glass's past 11 jobs, clients spent an average of $2.5 million each. "Value engineering" might save me a few thousand bucks by reducing the ambition of the job. Glass's clients can knowingly save massive sums by clever substitutions. Changing a custom-made mosaic tile floor to standard stone can cut the cost by a third, for example. Another client who substituted high-quality drywall for plaster recently saved thousands. 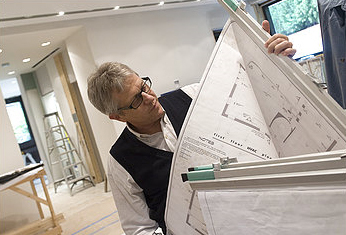 Glass, 54, said the key to his profit is starting early with clients and architects. "We try in most cases to get involved in projects in very early stages, like the cocktail-napkins sketches," Glass said. If he can nip enough of his costs here to spend a little more there, and employ his labor and materials efficiently, Glass normally earns a net profit of 10 percent. Not bad when you are talking about a $2 million job. "I've never lost money on a job," he says proudly. But he has been burned a few times: Some clients (they must pay monthly) stiff him on the last payment. Others have backed out at the last minute, after Glass spent thousands in prep work. Glass has been around construction most of his life. He fell in love with old homes helping with woodwork and repairs at his grandfather's farm in southeast Ohio, a region filled with historic old mansions. He worked summer jobs cutting stone, setting bricks and learning masonry. He studied fine arts, first at the University of Colorado and later at the University of Michigan, but kept working on homes in between as an apprentice carpenter. He ended up in Washington around 1980 when a friend from Michigan enlisted him in renovating the family's Northern Virginia home, which led to more jobs. "I kept meticulous records on how long it took to do a particular job, how much money we made, how much materials we bought. What the doors and windows cost," he said. "I kept all the information, along with receipts and files, in a notebook, and I would refer back. I have built over 30 years a detailed record of what things cost." After some booms and busts, he started Glass Construction at his dining room table on Swann Street with about $5,000 in his pocket. His storage facility was his carriage house in the back. 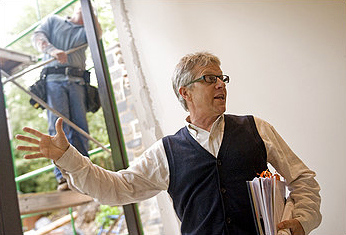 His expertise in historic homes started with a renovation on a late 18th-century Georgetown townhouse on N Street. Another early success was a Beaux Arts limestone bank on Capitol Hill, with 22-foot ceilings. A cardiologist wanted it renovated to display his art. He shares information on craftsmen, restoration techniques and the latest materials through an online group called Remodeler's Advantage as well as the National Association of the Remodeling Industry. He can find blacksmiths who do wrought-iron work using a forge, anvil and hammer. He can find masons who custom-mix their mortar so it blends unnoticed with centuries-old brickwork. He can also find the antique doorknob that fits just right or locate the guy who remakes the hard-to-get part for the window on an 1810 house. "This whole Washington area is just full of trade people that are accustomed to the old iron work, stoneworking and woodworking techniques," Glass said. Most of Glass's work comes through word of mouth from architects and former clients. He also makes sure his Web site is snazzy and his awards receive publicity. "We try to get our name in front of architects as much as possible," Glass said. Glass has grown his niche into a neat profit. He draws a $100,000 salary and, in a good year, a dividend that's several times that. He employs 19, which costs him around $80,000 a month. Glass pays half of each employee's $6,000 in annual health insurance. He has no debt on the business and tries to keep around $800,000 in the bank at all times, allowing him to stay ahead of subcontractors such as carpenters and electricians, buy materials, meet payroll, utilities, insurance and other expenses without tapping a line of credit. In addition to his second-story Cleveland Park office, which he rents, Glass pays $1,800 a month to lease 2,500 square feet in a warehouse on 14th Street. "We are frugal," he said. Glass said revenue normally fluctuates between $7 million and $8 million a year, although revenue hit $11 million in 2006. But the biggest chunk of that money covers materials and subcontractors. His 10 percent net profit comes after other expenses, too, including payroll, materials, subcontractors and administrative costs. Business is slow this year (he has seven projects in the works, compared with 10 normally), so Glass is hoping to eke out a small profit or break even. He is using the downtime to get managers certified in green building technology and to teach them Microsoft Access so they can schedule and budget more efficiently. His latest project: disassembling and moving two historic Virginia farmhouses for investors in Rappahannock County. The homes would then be rebuilt and restored using the latest green technologies.